A couple weeks ago, I discussed one of the movies I saw at this year’s Fantasia film festival, OXV: The Manual (which has since won the festival award for Most Innovative Feature Film). The last film I saw at the festival this year was one of the ones I was most looking forward to: the international premiere of Gatchaman, an adaptation of the Japanese cartoon series Science Ninja Team Gatchaman (which you might know as Battle of the Planets or G-Force, depending on your age and place of residence in the 70s and 80s). My reaction to it was a bit complicated. As an adaptation, it’s mediocre at best; as a film it has serious issues. But I enjoyed it quite a bit. A hell of a lot, in fact. And yet … I can’t help but be aware it could have been better. Some basic information first: the film was directed by Tôya Satô from a screenplay by Yûsuke Watanabe. It’s scheduled to go into wide release on August 24 in Japan. 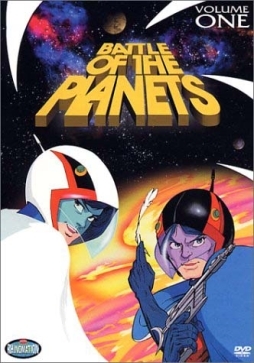 The original cartoon show ran for 105 episodes from late 1972 to late 1974, and in 1978 was repackaged for North American audiences (with significant edits and some new bits of animation) as Battle of the Planets. It got a second translation in the 80s as G-Force. In Japan, the series has spawned a number of sequel series, with a new series set to begin airing later this year. 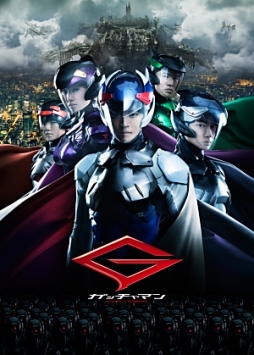 The characters in the original cartoon were a unit of five, as they are here, and the roles are basically the same: Hero, Hero’s Girlfriend, Hero’s Rival, Big Guy, Little Guy (Ken, Jun, Jo, Ryu, and Jinpei; the actors are, respectively, Tôri Matsuzaka, Ayame Gôriki, Gô Ayano, Ryohei Suzuki, and Tatsuomi Hamada). The movie changes their backstory considerably, and to some extent their personalities — notably, Hero’s Girlfriend is weakened, made less independent and more of a figure of fun, pining after Hero in a way that’s actively clichéd. But then at the same time, the movie sets up a nice dynamic between the various characters. Specifically, it’s the dynamic of the Fantastic Four, if the Sub-Mariner joined the team. Jun’s the older sister of bratty Jinpei, who has a practical-joking relationship with big Ryu; Jun has a crush on stoic leader Ken, but then dark brooding Jo shows up (Jo’s called George in the subtitles, but not in the spoken dialogue). A love triangle doesn’t really develop, but that’s because it turns out Ken and Jo share a Mysterious Past. It’s all melodrama in the high Marvel Comics manner, and by and large it works. Personally, as a fan of classic Jack Kirby comics, I loved it. I don’t know if it’s really Gatchaman — in many ways it’s a departure from the original show — but it’s damned fun. Similarly, the overall plot and especially the background departs radically from the cartoon. 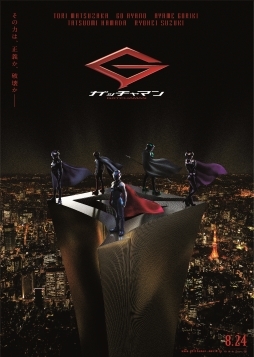 Instead of being environmental heroes fighting international terrorists, the story’s got an intriguing near-future setting in which Europe’s been devastated by a mysterious enemy, with Japan (and Science Ninja Team Gatchaman) one of the few forces capable of resisting the evil Galactors. Again, the secrets driving the plot turn out to be pure Jack Kirby: a virus (virus X, no less) causing what I can only call mutations, with some of the mutants good guys who fight for humanity, and some of them evil and fighting to conquer the world. A speech about how some of the evil mutants were known in earlier times as vampires and demons could have come straight out of The Eternals. At times, it’s more like a Marvel comic than most of the Marvel movies; but then it’s also much like a Marvel movie as well, complete with a post-credits sequence setting up a sequel. Except … the action and structure isn’t really there. In the cartoons, the Gatchaman team fought giant mecha; there’s only one bit in the movie that’s sort of like that, in the first act. It’s actually the best part of the movie, an exciting and taut action-driven set piece that briefly and effectively introduces the team and their powers. The problem is that the team then never use their powers until the end of the movie. There’s no fight scene in the whole of the second act, and the movie sags considerably. It’s nice that it tries to do different things — there’s a scene like a spy movie, another bit that’s a little like a horror movie, and so forth — but none of them quite add up. The spy movie bit never quite comes together plot-wise, though it ends with a nice Mexican stand-off between Ken and Jo … the result of which is then itself undercut a little bit later. But it’s the lack of action that’s key. Action sequences in super-hero movies are more than just visual set pieces; they should be key dramatic points, where themes and plot and character are all summed up and developed through the use of powers and violent conflict. The first act understood that. The rest of the movie forgot it; even the action at the end too often felt blurred and unspecific. The powers of the individual characters, the introduction of specific minor-villain opponents — it all seems to go for naught. The film never quite recovers from the lack of action. The melodrama suffers; the best Marvel comics worked because the melodrama was relieved by blazing action sequences, like a thunderstorm clearing the air. That never happens here, meaning the melodrama becomes cloying. Extended flashback sequences don’t help; they’re mostly well-deployed, but can’t help but slow the pace. Watching the movie with a boisterous crowd was interesting. After the high-octane opening action, the crowd was well on-side with the film; but by the end, they were clearly a little alienated and had somewhat turned against it. They’d been sitting on their hands too long, and there was never a real stand-up-and-cheer moment. Many of the cartoon episodes reached a climax with the team’s high-tech plane, the God Phoenix, bursting into flame as a means of attack; that happens here, but it feels tacked-on, coming too late in the action. That said, it’s a visual moment that works (and it did draw a cheer). As spectacle, the film’s uneven overall. The special effects in the first act aren’t quite up to Hollywood standard, though I found them effective nonetheless (I did wonder at one point whether the lack of action sequences in the second act was a function of a limited budget). The overall look of the film is solid, sleek and futuristic in Japan, gritty and devastated in war-torn Europe, with some nice nods to the near-future setting sprinkled in. In terms of capturing the look of the cartoon, it has its ups and downs. The team’s mentor, Doctor Nambu, is strikingly like the cartoon. The team members themselves have elements of their suits that recall the cartoon, but don’t quite capture the elegance of the original character design — capes shaped like feathers, visors in the distinctive shapes of the birds each team member’s outfit was designed to evoke. The main villain, Berg Katze, looked like the cartoon version; but the gender-subverting hermaphroditic aspect of the original character is distinctly toned down here. Overall, I enjoyed the movie a lot. But I can see why others didn’t, or wouldn’t. It’s by no means a faithful adaptation. And it so happened that its mix of homages, references, and story elements happened to particularly appeal to me. I enjoyed the bits of the Avengers movie I saw. I enjoyed the little bits of the Star Wars films I noticed. And I couldn’t help but get a kick out of the fact that the heroes were introduced with references to (if memory serves) Iron Maiden, Metallica, Pink Floyd, and (twice) King Crimson. But the structure just isn’t there. The story never quite takes off, never lives up to its beginning. Until about halfway through the movie, I thought it could end up in the running for at least my personal favourite super-hero movie. But it just didn’t figure out how to tell a good super-hero story. Subplots proliferated, didn’t develop, and were never resolved (and no, not in a clever meta-reference to Chris Claremont‘s X-Men run). And the last shots, of the team united, just felt oddly unearned. So in the end I liked it … but can’t help but be aware of how much it’s missing. 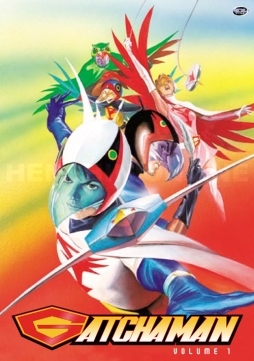 I loved Battle of the Planets as a kid. As an adult, I bought some of the DVDs and discovered I still liked it. The DVDs even had the actual Gatchaman episodes and I liked those as well (although I prefer BotP just because of 7Zark7). 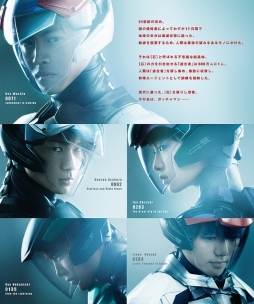 The idea of live-action Gatchaman is very intriguing.